It was the right thing to do and maybe it will set an example for other people. Who are the other people? Fellow dealers or private collectors? 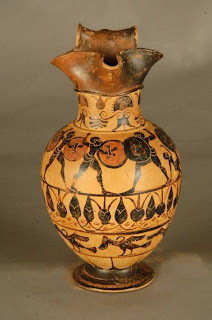 Royal-Athena Galleries, which handled some of the antiquities that have been returned from the Museum of Fine Arts in Boston and the J. Paul Getty Museum in Malibu, belong to the International Association of Dealers in Ancient Art (IADAA). It is now clear that the Code of Ethics and the due diligence processes conducted by members of the IADAA are not rigorous enough. All members undertake to check objects with a purchase value of Euro 3000 or over (or local currency equivalent) with the Art Loss Register unless the item has already been checked. Antiquities worth over half a million US dollars are likely to have fallen into this category. Did the Art Loss Register (ALR) --- an organisation also present at Basel --- issue certificates to say that the items had been checked? And if so, does the ALR need to address, as a matter of urgency, the issue of researching antiquities ? See Sharon Waxman's comments at http://sharonwaxman.typepad.com/waxword/2007/11/italy-scores-no.html.